Allingham is one of those authors whose books I’m always going to want to read; I love the Campion stories, and “Hide My Eyes is one of those. However, the other little volume is a short novel – novella almost at 139 pages – and it has a very intriguing history. “The White Cottage Mystery” was Allingham’s first detective story, originally published as a newspaper serial in 1928. It was never reissued later in book form as there was a need to edit out some of repetition which had been necessary by virtue of the serial format, so that readers would be reminded of previous events, and Allingham simply didn’t have the time. However, some years after her death, Allingham’s sister Joyce made those edits, and this version is the one presented here. “White Cottage” features the detecting duo of Jerry Challoner and his father, the famous Scotland Yard man, Detective Chief Inspector W.T. Challoner, and engaging pair they make. The mystery begins with Jerry being deflected on a drive home to London, as he happens to be passing the White Cottage of the title when a murder is discovered. Eric Crowther, resident of the neighbouring house, the “Dene”, has been found in the dining room of the White Cottage with his head rather fatally damaged by a shotgun, which is lying on a nearby table. W.T., as he is known, appears pronto from the Yard and begins to look into the crime with his son in tow. The problem is that just about every inhabitant of the White Cottage (and a few from the “Dene”) would have liked to see Crowther dead. Roger Christensen, wheelchair-bound following the Great War, is incapable of giving Crowther the thrashing he thinks he deserves; his wife Eva is terrified of the dead man and obviously has some secret to hide, trying to avoid the man who is constantly bothering her; the family nurse, in charge of young June Christensen, loathed the man and makes no bones about declaring this; Eva’s sister Norah has also suffered the man’s attentions, much to the disgust of young Jerry, who’s obviously smitten. And then there is Crowther’s dodgy butler and the strange Italian who was living in his house. The Challoners will have to do plenty of globe-trotting and digging into the pasts of all the characters before coming to a dramatic solution, and an entertaining journey it is! That is often the real tragedy of a case like this. The whole of our civilization is one network of little intrigues, some harmless, others serious, all going on in the dark just under the surface. A crime calls the attention of the community to one point, and the searchlight of public interest is switched on to this particular section of the network. The trouble is that the light does not fall upon one spot alone, but shows up all the surrounding knots and tangles, making them out of all proportion by their proximity of the murder. I thoroughly enjoyed “The White Cottage Mystery”, although I must be honest and say it probably isn’t Allingham’s strongest work. Not only was it her first detective story, but also it had to work within the restrictions of a newspaper serial which presumably entailed keeping it simple. Nevertheless, there’s much to love about the book; the plot is clever and watching the Challoners attempt to solve it is very entertaining. They suspect person after person only to have to dismiss them, and there are a number of very satisfying red herrings and sub plots. For a slim book, there’s a lot of twists and turns and as well as murder there’s blackmail and cruelty and burglary and hardened criminals and the French secret service and international gangs! The settings range from Kent to Paris and the south of France, and the pace never lags. As for the solution – well, there *is* one despite the apparent inability of anyone to have committed the crime, and W.T. does solve the mystery although all is not revealed until some time later. I confess I did at one point consider the killer as a possibility but I dismissed it, so it just goes to show that you should never underestimate a Golden Age crime writer. Making the Acquaintance of Mr. Campion! I’ve probably moaned before about the knotty problem of trying to decide what to book to take on a train journey and for a day out; and the issue reared its head again when I had my lovely LT meet up recently. I had just finished one book and was expecting a review copy – which actually arrived just before I left for my trip! However, the review book was big and heavy, and I really didn’t fancy lugging it round London with me, especially if I was going to be buying more books…. Fortunately, I spotted a small pile of Margery Allinghams – I picked up a set of three when someone at work was putting in a Book People order, and at £5 for the set it seemed rude not to! And since this included the first Albert Campion title, published in 1929, that seemed like the ideal kind of light read (mentally and physically!) for my journey. Back in my twenties I read stacks of Golden Age crime fiction, and I really would struggle to tell you now which titles I read. Allingham was one of the ones I loved, and I made my way through a lot of Albert Campion stories. I remember enjoying them very much; however, when I read “The Tiger in the Smoke” recently, Campion actually didn’t have the major part so I was keen to see how he appeared in his first story. Black Dudley itself is a country house deep in the wilds of East Anglia. Visiting for the weekend is George Abbershaw, a somewhat staid young man; a pathologist by trade and occasional assistant of Scotland Yard, he was at college with the owner of the house, Wyatt Petrie, and his interest in attending the house party is mainly the presence of Meggie, a flame haired young woman who makes him want to behave in an altogether more lively fashion than he usually does! Also present are Colonel Coombe, Wyatt’s uncle by marriage who lives in the house; the Colonel’s doctors and rather sinister friends; a random group of bright young things known to Wyatt; and a rather strange young man called Albert Campion, who nobody actually seems to know and nobody actually seems to have invited! The house is, of course, dark and creepy and full of secret passages and family legends, the latter involving the Black Dudley dagger which is supposed to reveal a person’s guilt. Wyatt suggests they play the traditional game whereby the dagger is passed round in the dark, although Abbershaw is not at all happy about that. Needless to say, things go wrong and someone is murdered. However, all is not what it seems; Abbershaw and another doctor, Prenderby, are both asked to sign a death certificate without seeing the body; and an important possession has gone missing which some of the residents are very, very keen to get hold of. Suddenly, the guests are prisoners in the house, being held by a sinister gang with no way to escape. But can they trust Albert Campion, a man who seems to know more about what is going on than any of them? “The Crime at Black Dudley” was a fabulous read, and perfect for a slow train journey! Allingham’s writing is excellent and atmospheric, and this was pure Golden Age crime fiction. What was particularly interesting was to see that in Campion’s first appearance, he was not initially the main focus of the story! Abbershaw is quite obviously intended to be the detective and focal character, but as the book progresses Campion gradually comes to the fore, almost as if Allingham changed her mind as she was writing and decided that he would be a much more interesting detective than her initial choice! However, this is obviously an act, as when the going gets tough it is Campion who comes up with solutions and proves that despite his protestations to the contrary, he can handle a gun and deal with the physical stuff. And the threat the guests are facing is very real and convincing; the baddies may be a little cartoonish but they are pretty nasty and although nothing unpleasant takes place on camera, it *is* implied. This may be the world of Golden Age mysteries, but it’s not a place where the crimes are lightweight and the villains trite. The thought that possessed Abbershaw’s mind was the pity of it – such a good brain, such a valuable idealistic soul. And it struck him in a sudden and impersonal way that it was odd that evil should beget evil. It was as if it went on spreading in ever-widening circles, like ripples round the first splash of a stone thrown into a pond. Campion here is presented as something of a mystery man; his name is not his real one, he is working outside of the law, and Abbershaw has come across him before. In fact, at one point Campion whispers to him the name of his mother, and Abbershaw is dumbstruck. All of these elements do make him a better choice as a major character! One of my favourite blogs is Past Offences, which is always a great source of reviews of classic crime fiction. 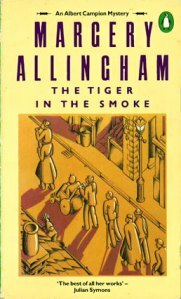 Recently, they did a wonderful series of posts on Margery Allingham’s “The Tiger in the Smoke”, an Albert Campion mystery from 1951. Alas, many of my old crime books went in a purge some years back, but coincidentally I picked up a copy of “Tiger” in a charity shop last year, figuring it would be nice to revisit a Campion novel – and these lovely posts prompted me to pick it up! The Tiger of the title is knife-man Johnny Havoc, on the run from jail and with a very particular agenda; the Smoke is of course an old term for London, but could also refer to the severe fog which has hit the city, making it easy for criminals to elude justice, all smoke and mirrors. However, the story opens in a slightly low-key way, with Meg Eglinbrodde and Geoffrey Levett, who are engaged, in a cab on the way to meeting Campion and Inspector Luke. Meg’s husband, who was reported killed in WWII, has apparently made a miraculous reappearance, via a series of fuzzy photos. Is this a case of blackmail or something more sinister? It’s not obvious initially what connection there is between this case, and the ‘Tiger’ of the title. There is a rather alarming band of ragged ex-servicemen making a living as a street band; Meg’s father Canon Avril and his household who are quite a motley bunch; hints of the past and reminders that though people have been trying to throw off the wartime blues and move forward, the conflict is still very alive in some people’s minds. One of the first things that struck me about “Tiger” was the quality of the writing – it’s simply superb, and that’s something I often find in Golden Age Crime. The best of the books and writers (Sayers also springs to mind) were wonderful novelists who happened to write in the crime genre, which is why they’re still read now and will continue to be so. The plot and characterisation are gripping, and it’s a tribute to how good Allingham is that she manages to convey the immense feeling of fear, and the danger of Havoc, without ever resorting to the gory detail and ghastly effects of modern writing. In fact, it creates an even more dangerous atmosphere by just the threat of Havoc’s actions, his very danger and unpredictability. The constant shifts of perspective rack up the tension, and the suspense at some points is palpable. Allingham’s characterisation is also outstanding – from the poor, damaged lads in the band, through the Canon’s vindictive neighbour, to vulnerable Meg, all are real and convincing and alive; in fact, they’re almost larger than life in places, particularly Charlie Luke, the detective. The pacing of the story is carefully planned and the tale doesn’t rush to the climax, but steadily builds up, which is much more effective. I found myself completely gripped by this book, caught up in the atmosphere and the tension. This was not a traditional cosy Golden Age murder mystery, but more of a thriller, and thrilling it certainly was, full of exemplary writing and wonderful atmosphere. On the front of my edition crime writer and historian Julian Symons called it “the best of all her works” – and you can really understand why!